A new study found that portable pools are more dangerous than parents may think. During the summer months, a child dies every five days in a portable pool. The senior author of the study, Dr. Gary A. Smith says that this shows the need for consumer education and affordable protection devices. According to the first U.S. study on child drowning, from 2001 through 2009 the investigation shows 209 deaths and 35 near-drowning of children under age 12. Ninety-four percent of the victims were under 5 years old and 81 percent of the incidents occurred during the summer months. Smith, director of the Center for Injury Research and Policy at Nationwide Children’s Hospital in Columbus, believes that these alarming statistics are due to the pools being very inexpensive and accessible to buy in many stores. They are easy to assemble and keep children busy; therefore many parents opt to buy them due to the practicality. However, most parents never consider the danger. Small wading pools less than 18 inches deep through inflatable pools and other soft-sided pools up to 4 feet were the items being studied. The findings were comparable to the amount of drownings related to permanent in-ground pools, say the researchers at Nationwide Hospital and Independent Safety Consulting in Rockville, Md. that conducted the study. This means that parents should be just as cautious of these portable pools, as they are about permanent pools. 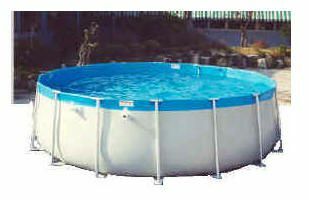 Majority of people that purchase these portable pools generally cannot afford all of the safety material that is recommended. These methods include fencing, safety covers, pool alarms, and ladders. Yet the most important safety measure is adult supervision. In the study, it is shown that children who were supervised by adults account for less than half of the drownings and near-drownings. Seventy-three percent of the drownings and near-drownings took place at home. Professor at the Johns Hopkins Center for Injury Research and Policy in Baltimore Susan Baker says that it’s time for us to begin requiring people to learn how to do CPR. She suggests making it high school curricula. Her recommendation was based on data in the report showing that CPR was administered before paramedics arrived in 15 percent of the drownings and 17 percent of the near-drownings. Smith said that drownings are much different than other childhood accidents because drowning generally leads to death and the child does not receive a second chance. Drownings represent the second-leading cause of injury deaths among young kids. If you have a potential child injury claim, contact Davis Law Group.